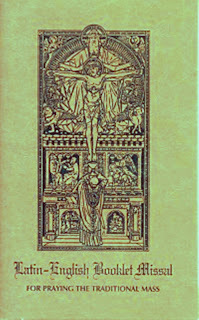 The Ecclessia Society of St. Joseph has reprinted 2,000 copies of The Traditional Latin Mass Booklet which will serve and guide Mass-goers as to the proper prayers, repsonses, rubrics, basic chants and devotional prayers peculiar to the Traditional Roman Catholic Mass according to the 1962 Missal of Pope John XXIII and as approved by Pope Benedict XVI. 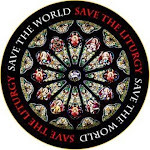 Let revised Latin-English Booklet Missal guide the faithful to a fuller, more prayerful participation in the old Mass in Latin. The Philippine edition is an adaptation of the original Booklet Missal first produced by the Coalition in Support of Ecclesia Dei in September, 1990. This Booklet Missal has sold over 115,000 copies nationwide and is now the best-known and most-used small missal at the growing number of Tridentine Masses authorized under Pope John Paul II's Ecclesia Dei and now under Pope Benedict XVI's Summorum Pontificum. The 68-page, 5 1/2" by 8" leaflet missal provides a compact source for praying the old Mass in Latin as well as other traditional prayers and meditations. Large, clear print, classic illustrations and concise explanations make the Third Edition easy to follow for senior citizens as well as helpful for younger Catholics and anyone unfamiliar with the rituals of the Tridentine Mass an other time-honored prayers of the Catholic Faith. Copies may be obtained at Our Lord of Divine Mercy Parish located at Sikatuna, Q.C., Philippines or through 09153321767 / 7809262. One may also send an email at dennisraymondm@yahoo.com. A donation of Php50.00(for Philippine Orders)or US$5.00 (for foreign orders excluding shipping fees) is requested to defray the cost of printing.